By using this site, you are deemed to have agreed to these terms and conditions of use. We reserve the right to modify them at any time. By using this site after we post any changes to these terms and conditions, you agree to accept those changes, whether or not you have reviewed them. If at any time you choose not to accept these terms and conditions of use, please do not use this site. Scope of Terms & Conditions: These terms and conditions apply to your use of all of the websites and services owned or operated Bama Beach Cams LLC., and all other websites owned, operated, licensed, or controlled by Bama Beach Cams LLC. or its subsidiaries (referred to herein as "BamaBeachCams.com.," "we" or "us") or any affiliated companies.These terms and conditions do not apply to your use of unaffiliated websites to which BamaBeachCams.com Website provides links. Restrictions on Use of Materials: You may not modify, copy, publish, display, transmit, adapt or in any way exploit the content of the BamaBeachCams.com Website. Only if you obtain prior written consent from us -- and from all other entities with an interest in the relevant intellectual property -- may you publish, display or commercially exploit any material from the BamaBeachCams.com Website. To seek our permission, you may write to Bama Beach Cams LLC, 1576 West Beach Blvd. - Gulf Shores, AL 36542. If permission is granted by us and by all other entities with an interest in the relevant intellectual property, you may not change or delete any author attribution, trademark, legend or copyright notice. You must abide by all additional copyright notices or other restrictions contained on the BamaBeachCams.com Website. Links: These terms and conditions apply only to the BamaBeachCams.com Website, and not to the websites of any other companies or organizations, including those to which any of the BamaBeachCams.com Website may link. We are not responsible for the availability of any other site to which any of the BamaBeachCams.com Website links. We do not endorse or take responsibility for the contents, advertising, products or other materials made available through any other site. Under no circumstances will we be held responsible or liable, directly or indirectly, for any loss or damage that is caused or alleged to have been caused to you in connection with your use of, or reliance on, any content, goods or services available on any other site. You should direct any concerns to that site's administrator or webmaster. 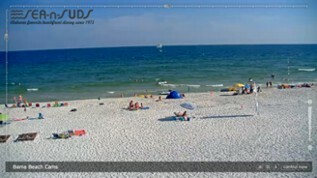 Other websites may use one of our link banners or text link to any of the BamaBeachCams.com Website. However, permission must be granted by us for any other type of link to the BamaBeachCams.com Website. 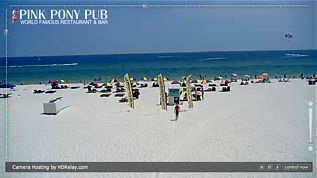 The webcams are property of Bama Beach Cams LLC and may not be placed on any other website without the permission. To seek our permission, you may write to Bama Beach Cams LLC, 1576 West Beach Blvd. - Gulf Shores, AL 36542.. We reserve the right, however, to rescind any permission granted by us, and to require termination of any such link to any of the BamaBeachCams.com Website, at our discretion at any time. Disclaimers: You must abide by any policies posted on bamabeachcams.Com website. Neither bamabeachcams.Com nor its respective suppliers, subsidiaries, or affiliates make any representation about the suitability of the information contained in the documents and related graphics published on this server for any purpose. All such documents and related graphics are provided "as is" without warranty of any kind. Bamabeachcams.Com and its respective suppliers, subsidiaries and affiliates hereby disclaim all warranties and conditions with regard to this information, including all implied warranties and conditions of merchantability, fitness for a particular purpose, title, and non-infringement. In no event shall bamabeachcams.Com its respective subsidiaries, affiliates and suppliers be liable for any special, indirect, or consequential damages, or any damages whatsoever resulting from loss of use, data, or profits, whether in an action of contract, negligence, or other tortious action, arising out of or in connection with the use or performance of information available from this server. The documents and related graphics published on this server could include technical in a bamabeachcams.Com innaccuracies or typographical errors. Changes are periodically made to the information herein. Bamabeachcams.Com or its respective suppliers may make improvements or changes in the products or services described herein at any time. Any material downloaded or otherwise obtained through the use of the service is done at your own discretion and risk and that you will be solely responsible for any damage to your computer system or loss of data that results from the download of any such material. Jurisdiction: This site is controlled and operated by BamaBeachCams.com from its offices in Gulf Shores, Alabama. BamaBeachCams.com makes no representation that the materials available on this site are appropriate or available for use in other locations, and access to them from jurisdictions where their contents are illegal is prohibited. Persons who choose to access this site from other locations do so on their own initiative, and are responsible for compliance with local laws, if and to the extent local laws are applicable. Copyrights: All materials on BamaBeachCams.com ’s Website are copyrighted and are protected under federal law, as well as international treaties and the copyright laws of other countries. BamaBeachCams.com materials may not be reproduced, copied, distributed, adapted, displayed, edited, published, transmitted, or downloaded in any way without the express written permission of BamaBeachCams.com . Use for any other purpose is expressly prohibited by law, and may result in severe civil and criminal penalties. Violators will be prosecuted to the maximum extent possible. The documents specified above do not include the design or layout of the BamaBeachCams.com website or any other BamaBeachCams.com owned, operated, licensed, or controlled site. All rights not expressly granted herein are reserved. Trademarks: The trademarks appearing on BamaBeachCams.com Websites, including but not limited to Bama Beach Cams LLC. and the BamaBeachCams.com logo are the property of their respective owners. Trademarks may be used publicly only with the express written permission of BamaBeachCams.com . The design and layout of the BamaBeachCams.com website is protected as trade dress and may not be copied or imitated in whole or in part. No logo, graphic, sound, image, or animation from any BamaBeachCams.com website may be copied or retransmitted unless expressly permitted by BamaBeachCams.com . Other product and company names mentioned herein may be the trademarks of their respective owners. Refusal or Discontinuance of Service: BamaBeachCams.com reserves the right to refuse or discontinue service to any user for non-compliance with these Terms and Conditions. Endorsements, Warrants & Guarantees: We do not endorse, warrant or guarantee any products or services offered on the BamaBeachCams.com website. We are not a party to, and do not monitor, any transaction between users and third party providers of products or services. Choice of Law and Forum: This Agreement will be governed by the laws of the State of Alabama. Any dispute arising from the terms of this agreement or breach of this agreement will be governed by the laws of the State of Alabama and you agree to personal jurisdiction by the state and federal courts sitting in Baldwin County, Alabama. The parties hereby expressly waive trial by jury in any action, proceeding or counterclaim brought by either of the parties against the other on any matters whatsoever arising out of or in any way connected with these Terms and Conditions and agree to submit to binding arbitration. BY ACCESSING THIS WEBSITE YOU AGREE TO BE BOUND BY THE TERMS AND CONDITIONS BELOW. THESE TERMS AND CONDITIONS ARE SUBJECT TO CHANGE WITHOUT NOTICE, FROM TIME TO TIME IN OUR SOLE DISCRETION. WE WILL NOTIFY YOU OF AMENDMENTS TO THESE TERMS AND CONDITIONS BY POSTING THEM TO THIS WEBSITE. IF YOU DO NOT AGREE WITH THESE TERMS AND CONDITIONS, PLEASE DO NOT ACCESS THIS WEBSITE.